I hope you all enjoyed the long weekend. We were happy to be able to spend some time with our girls. On Saturday, we spent the day at the gym where my youngest used to play volleyball. Gosh, we logged a lot of hours there back in the day. It was fun meeting up with old friends, coaches, and seeing the girls my daughter coached. They were 12 and under when she coached. Now they are 16 and up, and some have signed to play in college! Say what?!!! I shared with you our organized pantry last week. In that post I mentioned that we store our extra spices in the door rack, but that the ones we use daily are in a specified drawer near where we prep our meals. So, I thought I would show you that today. Having them in clear jars (from the Container Store) and clearly labeled makes finding what we need super easy. I love the clear jars because I can see if we are running low on something. I can then either fill it from our "extras" in the pantry or add it to our grocery list for the week to restock. The labels are from the Martha Stewart line for Avery, sold at Staples. I do not think they are carrying this line anymore, but you can find similar at most office stores. Today is hubby's birthday, and despite my having a horrible cold and sore throat, we are going to try and make the best of it. At least I can prepare his favorite dish for dinner, Chicken Piccata. Will share the recipe later in the week. 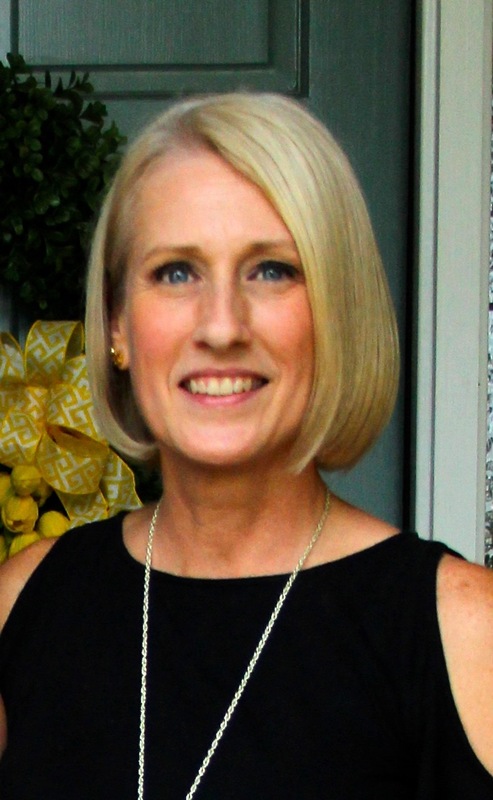 Linking up with Stacie and the girls for THOUGHTS OF HOME THURSDAY. Well ladies and gentlemen, we have another winner from the Hell's Kitchen Cookbook our daughter gave us for Christmas. And, we just might be making this again this weekend as our youngest was disappointed she was not home to try it!! Bring a large pot of salted water to a boil. Cook the tagliatelle according to the package directions until al dente. Drain the pasta, reserving 1/2 cup of the cooking water. 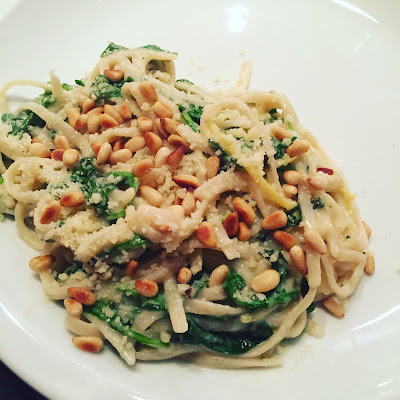 While the pasta cooks, toast the pine nuts in a small dry skillet over medium, toast the pine nuts until they are lightly browned and fragrant, watching carefully so that they don't burn. Transfer to bowl and reserve. Return the drained pasta to the pot. Add butter, lemon juice and zest, basil, Parmesan cheese, and the reserved cooking water. Cook over moderate heat, tossing just until creamy. Add the arugula and toss to combine, cooking until just wilted. Season to taste with salt and pepper. Divide the pasta between four bowls. Garnish with more chopped basil and reserved pine nuts and serve with more Parmesan Cheese. Not only was this very easy to prepare, it was delicious-full of flavor, and so colorful. LINKING UP FOR TUESDAY TALK and THOUGHTS OF HOME THURSDAY. THANKS FOR HOSTING LADIES!! 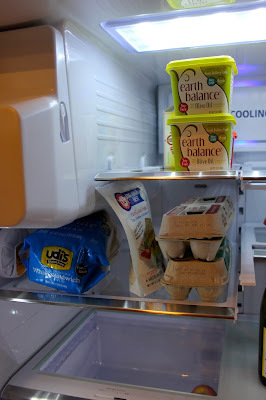 Yesterday I shared our organized frig with you. I shared how by taking just a few minutes each week prior to meal planning and grocery shopping, you could save not only time but money. Today I am sharing our organized "staples" pantry. We have two other pantries, one smaller and one a good size that we use primarily for baking supplies and snack items. And, at the end of the post I will briefly share how I meal plan each week. The pantry door houses most of our extra spices (I store the majority in a drawer near the area where we prep most of our meals), salts, peppers, honey, corn syrup, molasses, various oils and vinegars, cooking wines and extra condiments. The unit is from the Container Store's elfa collection, one down support with various sized baskets added to hold items. I love this system because it is adjustable unlike some that have stationary shelves/bins. Inside the pantry, the very top shelf (not pictured) holds cake and cupcake storage as well as a couple plastic pitchers we only use on occasion. The next shelf from the top is where we store all of our stock and broth, as well as our the gluten free stuffing we stock up on during the holidays. The next shelf down is where we store our canned beans, sauces, soups, olives, jellies and to the right seasoning packets and box mixes. On to our pastas, rices, and instant potatoes. Then baking mixes (pancake, pizza dough, corn bread), panko and bread crumbs, cake and muffin mixes and our spice rubs/marinades. The containers are part of the OXO line, and the chalkboard labels are Martha Stewart for Office Max/Office Depot. A glance at them all together. The very bottom is where we store our little Cairn's food and necessities. 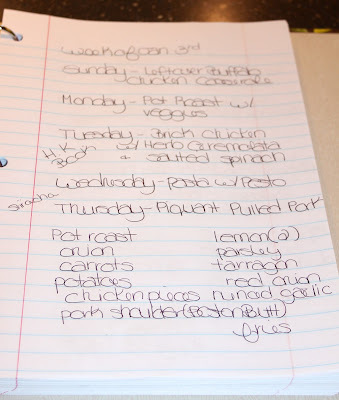 Having all of the basics on hand is a real time saver when planning our meals for the week. And, there is generally enough staples to pull together a quick meal in a hurry if we need to. For meal planning, I have a binder filled with just plain notebook paper. I have used fancy planners in the past and I have used spiral notebooks. All work equally as well. I pull out my cookbooks, cooking magazines and things I have pinned off Pinterest and get to planning. I write the week at the top, and then go day by day. As I decide on recipes I add ingredients we are in need of at the bottom of the page, thus creating my shopping list. I generally transfer this to another pieces of paper that might also have other items that we need to restock. I generally try to write where the recipe came from so that on the night of that particular meal it is easy to find the right cookbook, etc. It also helps when we go back a few months later and want to make the meal again. I hope these tips help simplify meal planning and grocery shopping for you. Today I wanted to share with you how we stay organized when it comes to planning our meals for the week. Let's face it, we are all super busy these days and as moms can sometimes be pulled in 100 different directions. I remember the days of having to be out the door by a certain hour, homework, sports practices and such. As a family we made it a priority to eat dinner together every evening. Trust me, there were nights when that was no small feat and a few that just didn't happen. 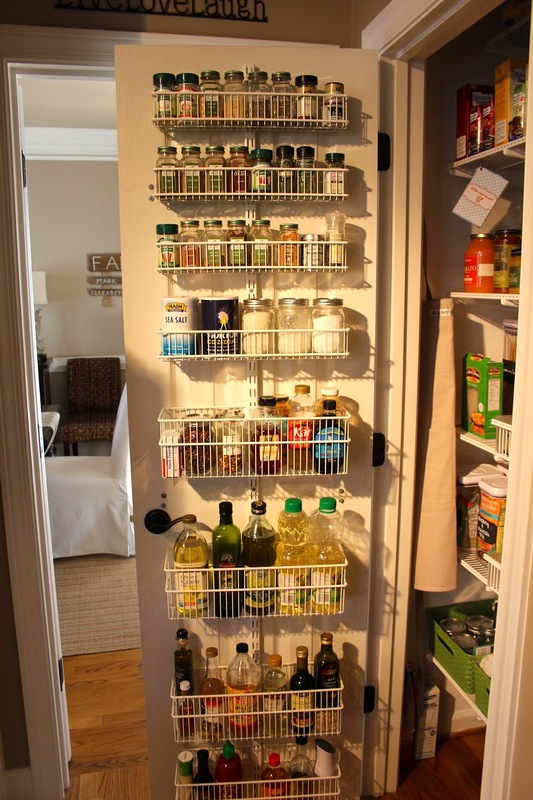 The key to successful meal planning is having an organized fridge and pantry. Knowing what you already have on hand and planning your meals around those items. The bonus is that it not only saves your sanity, but it saves you time and money as well. And, we all could use a little more of both! Another key factor is taking into account your families schedule for the week. Late afternoon practices or game nights are perfect nights for a crockpot meal. 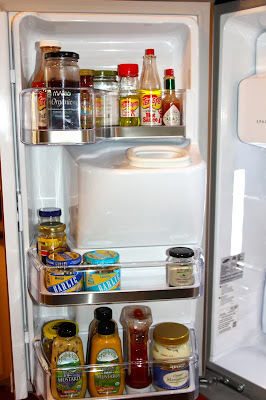 First I am going to share our organized frig. I know many of you deep clean your fridge only a handful of times a year. Well, I rarely have to do that because I take about 10-15 minutes on Sunday before I meal plan and grocery shop to take inventory and wipe down things that need it. One, it saves me from the dreaded "ewww gross" deep clean down the road and two, I now know what I need when shopping. No more buying only to find out we had three bottles hidden in the back of the fridge. 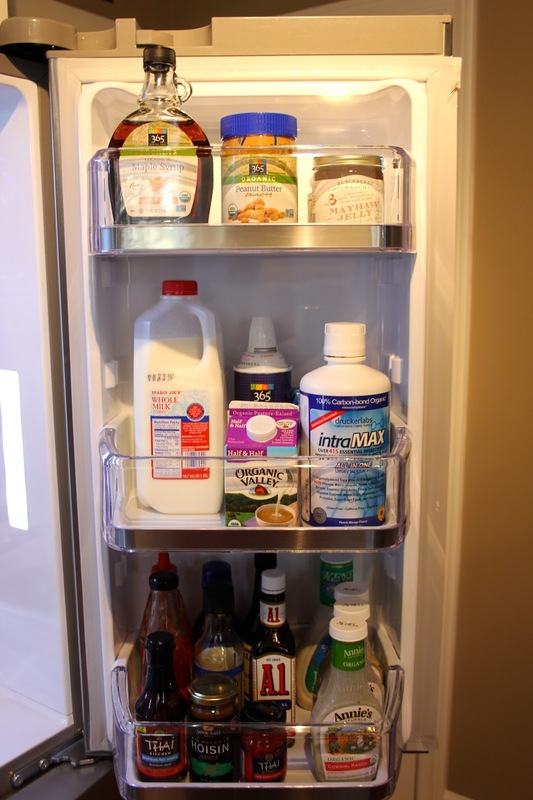 We keep most of our condiments and such in the doors of the frig. This way we can see most things at first glance. And, we try to keep them in the same place all the time making it easier to know when we are either getting low on something or in need of a replacement. The top shelf normally holds small juice containers, sodas, etc. The half shelf usually stores the few "extras" that we only use on occasion or I sometimes use it to store our meats for the week in ziplocs. 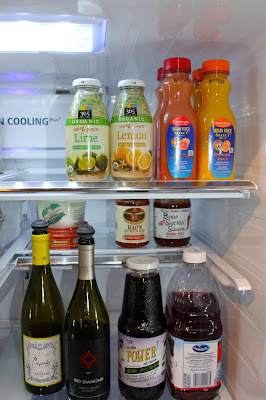 Bottom shelf holds larger bottles of juice, wine, etc. Butter, both tub and stick are stored on the top left side. Followed by bread, eggs, and sometimes bacon. The bottom left is usually reserved for larger items, such as salad greens or leftovers. And of course we use our crisper bins for produce. Our frig drawer is used to store yogurt, applesauce, cheeses, cold cuts and the like. I love the small white plastic bins we purchased at Target that help keep like things together. Our top freezer drawer is where we keep breakfast items, frozen fruit for smoothies, pie crusts, and variety of nuts. The bottom larger drawer is where we store pizzas, bread, frozen dinners, frozen vegetables and such. As you can see from the pictures most items are clearly visible on first glance. It really is a time saver! This was taken prior to our grocery shopping for the week. Remember, we are empty nesters so those of you with larger families at home will have more to store but it can still be done! 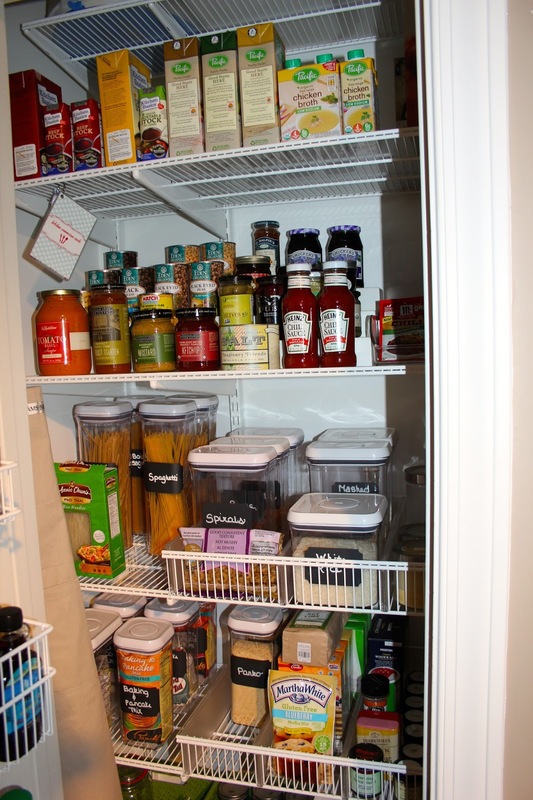 Tomorrow I will share our organized staples pantry with you, and how I meal plan. Yes, I realize it is Thursday...but this one was too good not to share, even a day late! I have missed sharing our yummy home cooked meals with all of you. I took a bit of time off over the holiday season to spend time with family and friends, but am looking forward to posting in the coming weeks. Our oldest gave her dad The Hell's Kitchen Cookbook, recipes from the Kitchen, for Christmas. She knows we are big fans of the show. 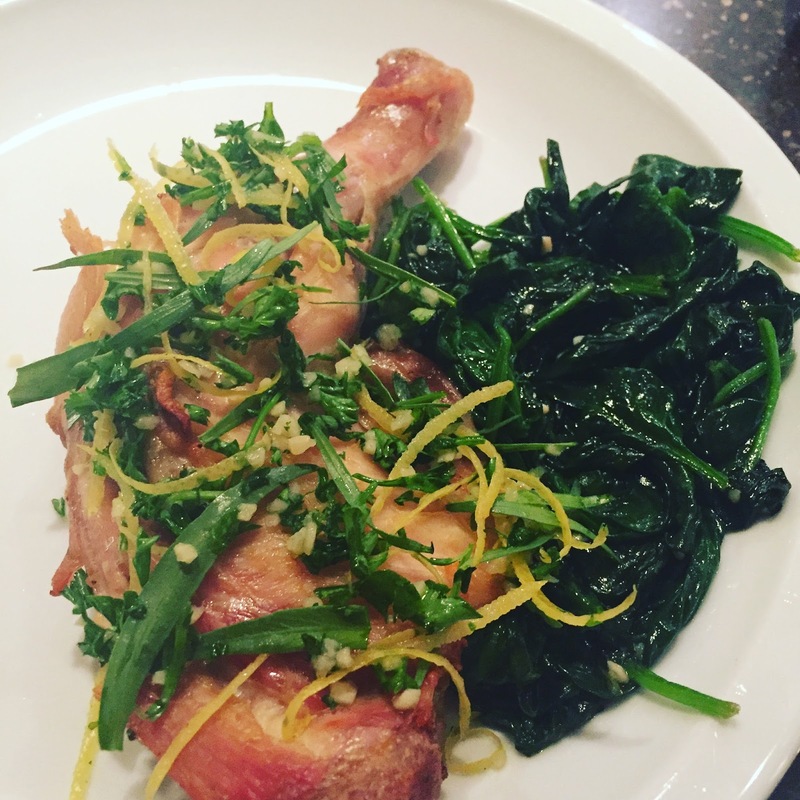 The first recipe we decided to try was Brick Chicken with Herb Gremolata. It was a definite winner. Super easy, and quite delicious. Mix 1 TBS olive oil and salt and pepper together in a small bowl. Place the chicken on a cutting board, skin side down. Using your hands, press firmly on the breastbone to flatten the breast. (you can skip this step with certain pieces) Brush the chicken on both sides with the olive oil mixture. Heat an ovenproof skillet (preferably nonstick if you have one) large enough to hold the flattened chicken over medium-high heat for about 3 minutes. Put remaining olive oil in the pan and wait about 30 seconds for it to heat up. Place the chicken in the skillet, skin side down; weight it with another skillet or with one or two bricks wrapped in aluminum foil. The idea is to flatten the chicken by applying weight evenly over its surface. Cook over medium-high heat for 5 minutes, then transfer to the oven. Roast for 15 minutes more. Take the pan out of the oven and remove the weights; turn the chicken over and roast 10-15 minutes more, or until the juices run clear or an instant-read thermometer inserted into the thickest part of the thigh registers 165*F.
We served it alongside sauted Garlic Spinach. 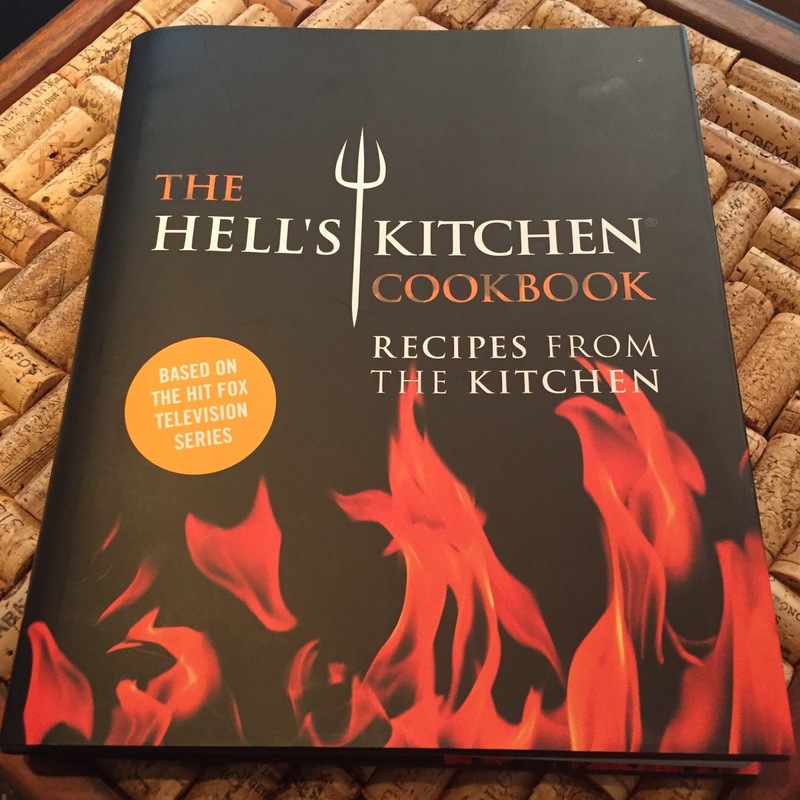 We can't wait to try some of the other recipes from the cookbook. Enjoy! !